Here in Florida, when it cools off in October, it's time to get back on the trails that were too hot to run all summer. Like the Apopka Loop Trail. This trail winds around Lake Apopka with no shelter, no shade and no facilities. 18 miles from one end to the other and nothing but wildlife in between. On this trail you MUST carry in your own hydration. That's why you can't run it in the summer. You simply couldn't carry enough unless your just going a couple of miles out and back. 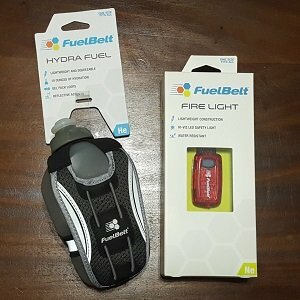 When you're going further, a palm bottle like the Fuel Belt Hydra Fuel is perfect. 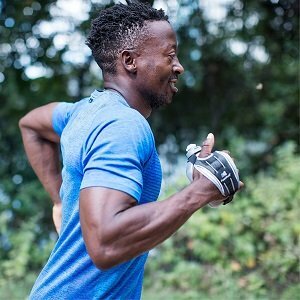 Holding 10oz is light enough to be comfortable and enough water to help you through a 10 or 12 mile run. If you're going longer, maybe carry two and you're good. You can strap two gels to the back of it and make meal out on the run! The strap is adjustable for any size hand. Relax your hand because you can hold this bottle without gripping it! Hydration is important all year long. Don't think that just because it's cooling off or even cold, that you don't need water and electrolytes. And if you're running really long, add some carbs in that bottle, too! And, hey, it's FREE when you subscribe this month! When the darkness comes early, community trails are still busy with cyclists, kids on skateboards and reindeer. Be seen when you are running! With the little light that's super bright! 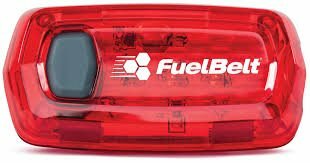 The Fuel Belt Fire Light. It's tiny and light as a feather and will clip on securely anywhere. With steady and flash modes, it's everything you want in a safety light and less! Simple and reliable and it just might save your life. Oh, you run on the street? In the dark? Like, where cars are? You're crazy if you don't have a light. Never fear, subscribe and I'll send you this one FREE! These are the kind of accessories that can make training through the winter fun and safe. I think you'll find them a great addition to your arsenal of stuff you get for FREE from Tri Fuel Monthly!